Bbq chicken, salad, garlic cheese, kidney beans and peri peri hot sauce. 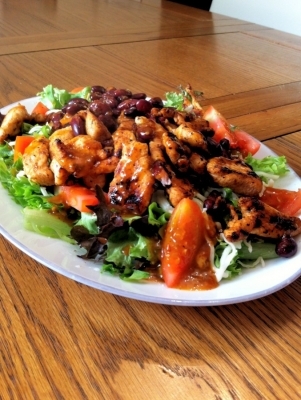 Chop up chicken and cook on pan with hot sauce and kidney beans. Lay both types of lettuce on plate, slice tomato into wedges, layer on top, add the rest of the ingredients and enjoy.